The Free Clinics is accredited at the highest level by the NC Association of Free Clinics. We are a 501(c)(3) nonprofit organization, and have a 4-star rating by Charity Navigator. The Free Clinics was the fourth free clinic in NC and the 73rd in the nation to be deemed under the Federal Tort Claims Act, by the Health Resources and Services Administration, Bureau of Primary Care. As a deemed clinic under the FTCA, The Free Clinics can offer volunteers complete immunity from malpractice claims during their services as a The Free Clinics volunteer. Establishing coverage under FTCA included initiating Peer Review and Quality Assurance programs to ensure the highest quality of care. 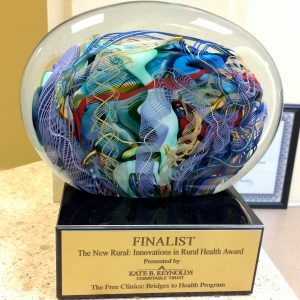 In 2016, TFC’s Bridges to Health program was chosen as a top three finalist for the Kate B. Reynolds Innovations in Rural Health Award for our work over the last six years. In November of 2015, our Executive Director Judith Long was honored with the T. Kennon Roberson Award Recipient for Management Excellence in Non-Profit Health & Human Service Agencies at the Association of Fundraising Professional’s Annual Philanthropy Day Luncheon. In May of 2015, our Executive Director Judith Long was awarded the prestigious Athena Award which honors exceptional women leaders in over 500 communities worldwide. The award was brought to Henderson County in 2008 by Vanessa Y. Mintz, and is given in her honor through the Henderson County Chamber of Commerce and The Athena Award Committee each year. In 2009, The NC Association of Free Clinics awarded board member and volunteer Colin Thomas, MD the Don Lucey Award in thanks for his service to NC free clinics and the people they serve. In 2008, The Free Clinics was named the Citizen of the Year by the Hendersonville Civitan Club for outstanding achievement of unselfish service in the betterment of our community. In 2007, Bares it All for Breast Cancer created its Hope and Humanity Award, which honors a remarkable individual each year. In creating the award, Bares It All selected The Free Clinics to be the recipient of the donation which honors the recipient. The Hope and Humanity Award plaque naming the annual recipients is at The Free Clinics. The Free Clinics’s Psychiatric Clinic was awarded the 2007 Community TIES award from the NC Association of Free Clinics and the Blue Cross Blue Shield of NC Foundation for Innovation in the creation of the psychiatric clinic to meet a critical mental health need in our community. The Free Clinics’s Dental Clinic was awarded the 2006 Meritorious Award in Community Dentistry by the American Dental Association, one of only four dental programs in the country to be recognized for its work in the local community.